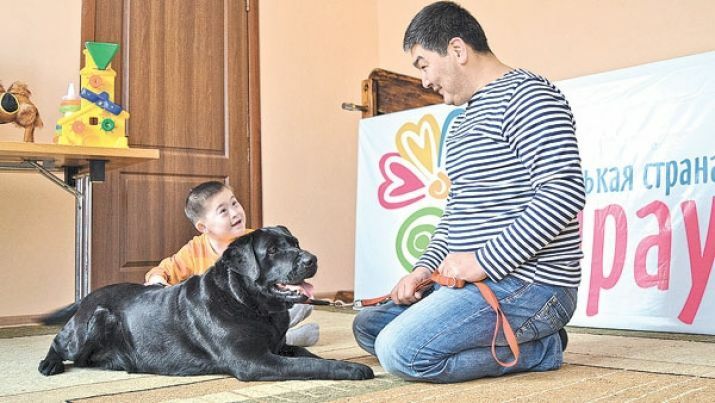 ASTANA – Yerlan Kumiskaliyev, chair of the Atyrau Is a Small Country public fund and one of Kazakhstan’s 100 New Faces, is working to support children with brain and spinal cord injuries. He is also building a small village for the youngsters to help them adapt and become full members of society. Born in 1971 in the Atyrau region, Kumiskaliyev’s life was shaped by two family situations. When he was young, his father suffered a stroke, and the son decided his future would be devoted to helping others. After graduating from high school, he entered medical college. He worked in the healthcare field, then enrolled in Kazakh Law University in Taldykorgan. After returning to Atyrau, he taught at the Humanitarian and Technical College. The second part of his story began when he took his sister to China for a medical examination. While there, he was also checked and diagnosed with a significant illness. During his treatment, he decided that if he recovered he would dedicate his life to helping people in need. “I was shocked. From that time, I started a fight for my life. I had so many dreams and plans… I was very young… During the treatment, I lost 30 kilogrammes… One day I opened my eyes – my bed was in front of the window – I saw a huge moon and I said, ‘if God makes my dream to return home come true, I will dedicate my life to those with difficulties who need my help,” he told The Astana Times. 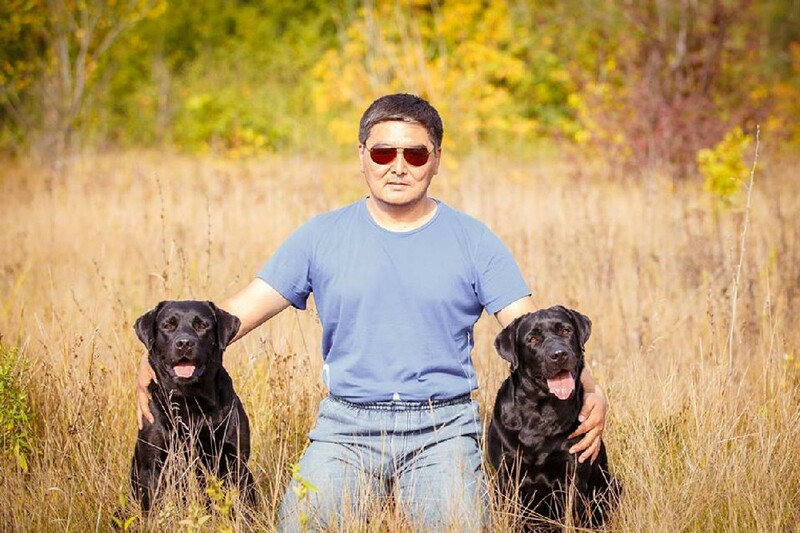 Returning to Kazakhstan, he wanted to open a canine therapy centre based on his own experience of communicating with dogs during his recovery. “It was 2007. I remember that dogs were brought to our clinic. Volunteers brought them once a week… It was a great happiness for us (patients). We waited every Wednesday of the week… I believe that my recovery is a merit of dog therapists. When they come and lay on your hands looking with kind eyes, everything changes. At that time, an idea came to my mind, ‘there are also patients in my city,’” he added. Kumiskaliyev wondered about ways to incorporate canine therapy at home. He began by thinking about his ability to raise such dogs and held sessions for people. He also considered others’ reactions to his idea. Finally, he discovered an organisation to help implement the project. “I found an organisation on the Internet and started to expand my knowledge in canine therapy. I contacted a dog kennel in Saratov city (Russia) that trains guide dogs, rescue dogs and dogs-canine therapists. I sent a request to them for dogs. Then, I waited for two or two and a-half years in a queue… After two years, they called [and offered] two puppies. For canine therapy the dogs should be brought in 10 days before they open their eyes… I brought them and they grew up as my own children,” he said. The Centre for Supporting Children with Brain and Spinal Cord Damage (cerebral palsy, Down syndrome and autism) was opened in 2012 with two Labrador puppies. 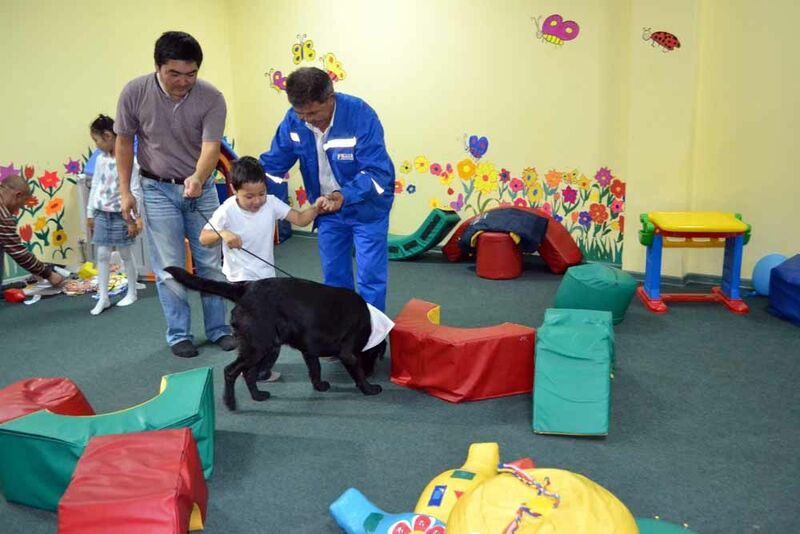 “Interestingly, one dog expressed great skills in working with active children such as children with Down syndrome and autism, while the other dog is good at working with bedbound children with cerebral palsy,” he noted. Rehabilitation and other assistance at the centre are always free of charge. It exists only on voluntary donations and attracts volunteers to help. “The principal difference of our organisation from others is that we do not ask for funds from the government. It is my choice. My mission in life is to help my country and to try to solve at least one problem… We develop social entrepreneurship. 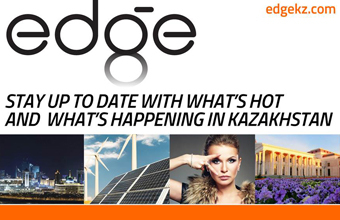 We earn funds for ourselves,” said Kumiskaliyev. Seventy percent of patients are children of single mothers. The centre also tries to help them, as a child’s successful rehabilitation depends on their psychological state. The mothers can attend various clubs such as dance, fitness and beauty for free. Approximately 80 percent of the patients are children with arm and leg sensitivity. Despite all the difficulties, some have been able to attend kindergarten and school after recovery. Kumiskaliyev travels around Kazakhstan helping children from different regions and cities. In addition to his two original male dogs, he has also raised a female Labrador. “Just from the Atyrau region I have 370 children and approximately 50 children in Almaty. Also, I have children from Pavlodar, Petropavlovsk, Ust-Kamenogorsk, Uralsk and other cities,” he noted. In the last several years, Kumiskaliyev has initiated plans for a small village for children with disabilities where he hopes to offer special facilities and different animals to create a pleasant atmosphere for their recovery. The village is expected to open in the spring. “Currently, we are building a small village on a territory of five hectares that the [Atyrau] region’s akim (governor) gave us. It is a special village, because it is the third such village in the world. The first one appeared in Aberdeen in the United Kingdom, the second one is located in the Yaroslav region of Russia and our ‘small country’ will be the third one. This territory is for helping these children to acquire certain skills that they cannot acquire in the city. Most important for us is to help a child become independent without help from parents,” he said. Kumiskaliyev expressed his deep gratitude to all those supporting him in the projects. “When society recognises you, it gives you a lot of strength. Because we work with children who are in such a difficult situation, we spend almost 24 hours a day with them. It is very difficult emotionally and when you get such a reward it inspires,” he said.